Castleford Tigers Women booked their place in the Challenge Cup semi-final with a 30-16 defeat of St Helens. In what undoubtedly was the headline fixture of the quarter-final draw, Castleford stepped up to the plate and slayed another giant in the competition. It can be argued that the Tigresses have had the draw from hell, coming up against defending champions Bradford in the first round followed by St Helens in the second. However, Lindsay Anfield’s team defied the odds and picked up yet another famous win. The game was on a knife-edge right from the start. It was like watching two heavyweight boxers trying to feel each other out before going on the offensive. The visitors tried to land the first blow. Tara Jones received the ball down the left flank and looked sure to score, but a last ditch tackle from full-back Tara Stanley prevented a score. Next, it was Castleford’s turn to try and land a shot and Kelsey Gentles brilliantly crossed the whitewash down the left wing. St Helens remained resilient and after being forced to defend for a solid quarter of an hour they hit back with a try from Naomi Williams. 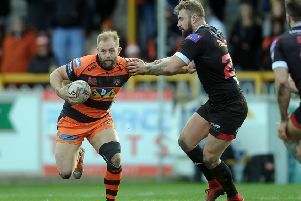 Castleford made it 12-4 at half-time, however, when full-back Stanley – known for producing moments of magic – pulled another one out of the bag with a spectacular full lengther. Stanley added a penalty kick from 20 metres out as the Tigers edged further ahead in the second half. Saints had to stop the rot and they did so in style. Two quickfire tries from Leah Burke and Lizzie Gladman put them within a couple points of the hosts. Should both tries have been converted, the visitors would have been ahead. Instead, Alex Wallace extended the Tigresses lead with her first try of the game, making it 18-12. Ten minutes later the lead was extended as Georgia Roche produced one of the plays of the match. Roche brilliantly kicked a 40-20 and went on to finish that set by powering over the try-line. Rebekah Wilson gave Saints hopes of a comeback with a try of her own. But that belief was soon dashed when Jones’ kick found the hands of Wallace who powered over the whitewash. Katie Hepworth’s third conversion of the game made the full-time score 30-16. Castleford have now been drawn out at home to York City Knights in the semi-final with Wigan Warriors at home to Leeds Rhinos in the other semi. The ties are due to take place week-ending July 15. What is impressive is the level of success the Tigresses are having considering the number of under 19s in the squad with more than half of the team against St Helens in that bracket, including a debutant in Courtney Pointon. This week Cas move back to Super League business with a home clash against York City Knights, which will act as a warm-up for the cup tie.